Vancouver, British Columbia--(Newsfile Corp. - February 13, 2018) - Thunderstruck Resources Ltd. (TSXV: AWE) ("Thunderstruck") is pleased to provide results from its recent exploration conducted at the Liwa Creek Gold Prospect in late 2017. Liwa Creek is part of a 148 sq km property held by Thunderstruck in Fiji, located 50km south of the Vatukoula gold mine, which has produced 7 million ounces of gold. Fiji is located on the Pacific Ocean's Ring of Fire, which contains many of the world's major gold and copper deposits, including Lihir and Grasberg *. Between November and December 2017 Thunderstruck crews completed 520m of hand trenching in four (4) separate areas of the Jensen and Liwa Ridge gold showings resulting in the collection of 117 trench channel samples. In addition, 123 prospecting rock grab, 110 ridge-and-spur auger soil, and 47 BLEG stream sediment samples were collected from the Liwa and Vatuvatulevu creek areas, which include the Liwa Ridge, Jensen's, and Gun gold showings. Commenting on the results, President/CEO Bryce Bradley notes that "Multiple examples of significant gold mineralization, as well as extensive anomalies, have now been uncovered across the expanse of our property. In particular, these results show that our Liwa and Jensen's discoveries are shaping up to be intriguing gold targets. Now that we have all permitting in place, we're entertaining joint venture opportunities to aggressively advance this exciting asset." Thunderstruck prospecting crews successfully located and sampled the historic Jensen's gold showing on Wainamoli Creek with two rock grab samples returning high grade gold values of 36.1 and 31.8 g/t Au; including 12.5% and 6.8% Pb (lead), respectively (Table 1). A total of 21 rock grab samples were collected along a stretch of the Wainamoli Creek outlining a 300m zone of anomalous gold values; including 8 samples returning greater than 0.2 g/t Au, and a series of discontinuous rock outcrop channel samples collected over a distance of 35m averaging 0.38 g/t Au. Excavation of a 261m E-W trending trench at the Jensen's gold showing was hampered by deep weathering along the western half of the trench and deep stream gravels along Wainamoli Creek. The 29.1m interval between 189.5 and 218.6 m uncovered a zone of weathered locally quartz-sulphide mineralized and intensely sericite altered and limonitic mafic volcanic rock. The highest trench value within this interval returned 0.1 g/t Au over 2.8m. The relationship of the trenched intervals to the true width of mineralization is not known. However, field relationships suggest mineralized zones may trend NE to ENE sub-parallel to the major drainage of Wainamoli Creek. Anomalous gold values within Jensen's trench are therefore interpreted to define the western limits of a poorly exposed zone of locally high grade gold mineralization to the east. At the Liwa Ridge Showing two trenches (Liwa North and South) were excavated having lengths 124m and 110m, respectively; separated 200m along strike and 100m vertically. The Liwa South trench returned, 1.2 g/t Au over 26.5m (from 5 to 31.5m, 6.2m un-sampled*), including 3.6 gram-per-tonne (g/t) gold (Au) over 4.2m (from 5 to 9.2m), within a broader anomalous gold zone averaging 0.61 g/t Au over 71.3m (from 0 to 71.3m, 14.7m un-sampled). 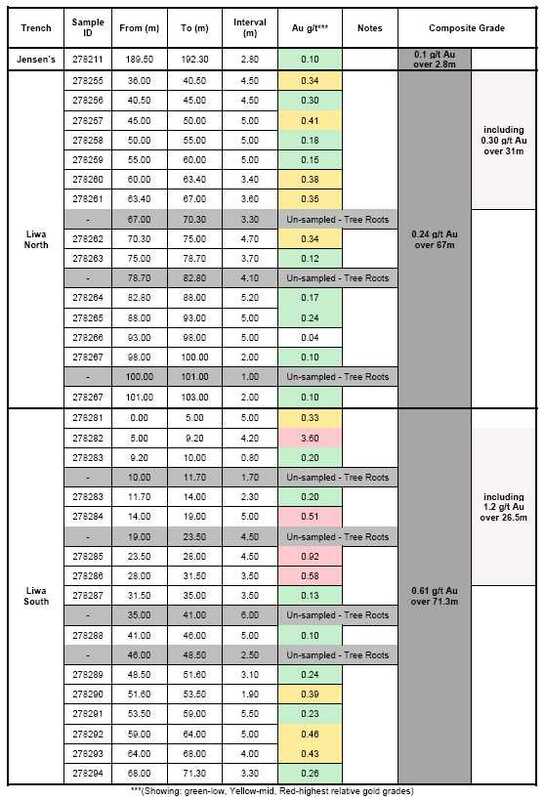 Mineralization is open to the east with the first trench sample returning 0.33 g/t Au over 5m (Table 2). The Liwa North trench returned 0.30 g/t Au over 31m (from 36 to 67m) within a broader anomalous gold zone averaging 0.24 g/t Au over 67m (from 36 to 103m, 8.4m un-sampled). Mineralization is open to the east under thick scree cover. To the west the trench crosses the 6m wide Liwa Creek drainage. Limited trench sampling on the west side of Liwa Creek did not return anomalous gold values, however select outcrop grab samples there yielded anomalous gold values of 0.11, 0.15 and 0.52 g/t Au. Geologic mapping confirms the presence of a sub-vertical 60m wide zone of hematite-silica-pyrite altered mafic volcanic rocks over a 400m strike and 100m vertical extent between the Liwa and Noda creek drainages. The zone is open to the north, south and east under scree and soil cover. A total of 46 rock grab samples were collected over a 600 x 200 m area surrounding the Liwa Ridge showing. Gold values ranged from below detection up to 8.13 g/t Au and 0.19% Pb, with a total of 7 samples returning greater than 0.5 g/t Au. Prospecting has extended gold mineralization 120m south of Liwa Ridge into the Noda Creek drainage where rocks grab sampling returned values of 1.27 and 3.54 g/t Au in outcrop. Auger soil sampling along Liwa Ridge revealed robust gold in soil values (0.64 g/t Au) coincident with trench-confirmed mineralization. An additional two auger soils collected at distances of 5 and 20m beyond the eastern limit of the Liwa South trench returned 0.24 and 0.55 g/t Au, respectively (the three highest gold-in-soil values to date); indicating potential to expand the mineralized zone eastward. The Gun Showing occurs on a remote north-south tending ridge in the headwaters of Vatuvatulevu Creek. Historic rock outcrop sampling at Gun returned 700 ppb Au, in association with quartz-sulphide rock float located in a tributary 300m to the northwest returning 12 g/t Au and 110 g/t Ag (silver). Current rock grab sampling within the tributary and along Gun Ridge comprised 21 samples, with six samples returning greater than 0.10 g/t Au. Rock float at the Gun Showing returned 0.44 g/t Au, including 25.5 g/t Ag; and 0.32 g/t Au. Rock float samples from the tributary returned 0.46 g/t Au including 0.12% Pb and 0.30 g/t Au. A single reconnaissance auger soils line comprising 21 samples spaced at 10m intervals trending southwest from the Gun Showing returned highly anomalous gold values. A total of 12 continuous auger soil samples collected over a distance of 110m returned an average of 28 ppb (parts-per-billion) Au, and up to 82 ppb Au, the highest gold in soil value of 110 samples returned on the Project outside three contiguous samples collected over the Liwa Ridge gold zone. Within the Liwa Creek Prospect, auger soil samples returning greater than 20 ppb Au are considered highly anomalous. The Company considers the results of auger soil, rock grab and stream sampling at the Gun Showing significant in that they demonstrate anomalous gold values over a 300m distance that remain open to the north, south and east in this remote and under-explored region of the Prospect. A total of 47 BLEG (Bulk Leach Extractable Gold) stream sediment samples were collected over a 3 x 2 km area of Liwa and Vatuvatulevu creeks. A total of 19 of 47 stream samples returned BLEG cyanide leach gold values in excess of 10 ppb Au and are considered anomalous. Of the 47 samples, a total of 10 samples returned greater than of 30 ppb Au, and up to 78 ppb Au. Anomalous stream samples define three (3) high-priority areas for follow-up prospecting: Liwa Ridge, Lower Vatuvatulevu Creek and the Gun Showing area. A total of seven (7) highly anomalous stream sediment samples collected from Liwa and Noda creeks averaged 48 ppb Au. The entire 1.5 km length of Noda Creek returned anomalous gold values (ranging from 34 to 78 ppb Au) from its headwaters where outcrop rock grab samples returned up to 3.54 g/t Au downstream to its confluence with Wainamoli Creek. Stream sampling results flanking the Liwa Showing indicate significant potential to extend the mineralized zone eastwards in agreement with auger soil sampling results and 900m south into the Noda Creek drainage. Within Lower Vatuvatulevu Creek, two eastern tributaries returned BLEG values of 49 and 45 ppb Au and a third returning 19 ppb Au. Angular rock float samples of brecciated and banded quartz-pyrite mineralized rock with 49 ppb Au returned values of 1.7 g/t Au including 0.32% Pb, and 1 g/t Au. Historic stream float rock returning 6.4 g/t Au with no known bedrock source was reported along this stretch of Vatuvatulevu Creek. The Lower Vatuvatulevu Creek gold in stream anomaly is located 650 east along the inferred strike of Jensen's Showing high grade gold rock samples. In the headwaters of Vatuvatulevu Creek, a tributary 300m northwest of the Gun Showing returned BLEG stream values of 28 and 29 ppb Au, indicating potential to extend mineralization further north at this newly developed prospect. Additional stream BLEG, auger soil and prospecting is considered a high priority as major drainages to the east and a prominent north-south trending ridgeline there remain to be evaluated. 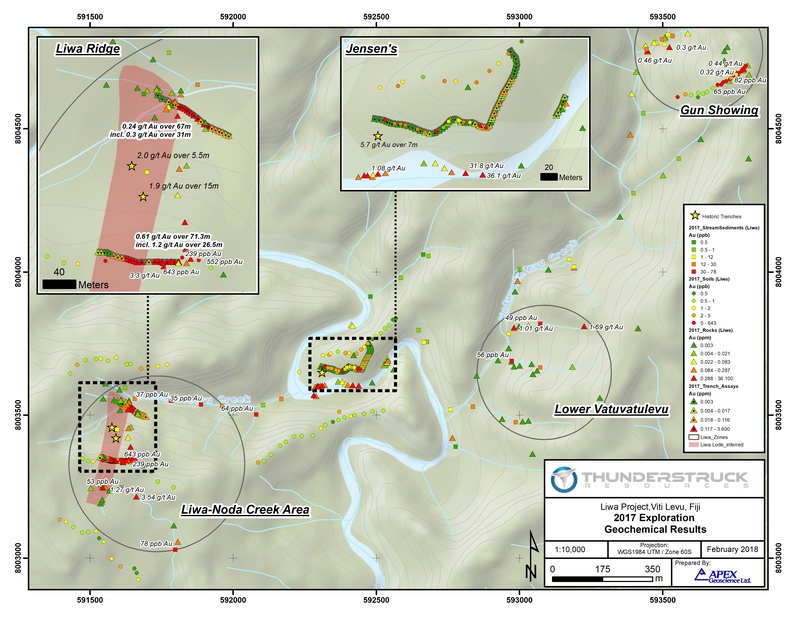 The work by Thunderstruck, building on the work by previous operators, has identified gold mineralization over an area of 3 km by 3 km. Samples from outcrops and trenches at Jensens and Liwa Ridge demonstrate the potential for the system to carry favourable grades, while the soil and BLEG samples at the other prospects demonstrate the presence of gold over a large area, suggesting the presence of a large mineralizing system, on a scale comparable to other large gold-bearing systems in the Pacific Rim of Fire. 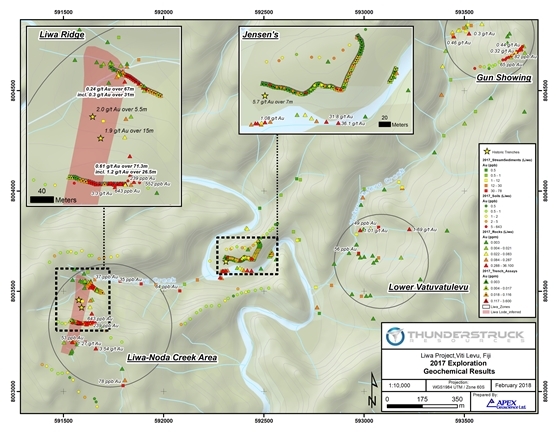 Thunderstruck Resources is a Canadian mineral exploration company that has assembled extensive and highly prospective properties in Fiji on which recent and previous exploration has confirmed VMS and Precious Metals mineralization. The Company provides investors with exposure to a diverse portfolio of exploration stage projects with potential for zinc, copper, gold and silver in a politically safe and stable jurisdiction. Thunderstruck trades on the Toronto Venture Exchange (TSX-V) under the symbol "AWE". Kristopher J. Raffle, P.Geo. (BC) Principal and Consultant of APEX Geoscience Ltd. of Edmonton, AB, is a qualified person for the project as defined by National Instrument NI 43-101. Mr. Raffle has reviewed the portion of the technical content of this news release as it relates to the Liwa Creek Prospect. During 2017 all stream sediment samples were submitted to Australian Laboratory Services Pty. Ltd (ALS) labs Perth for BLEG determination of gold. Auger soil samples were submitted for gold and multi-element geochemical analysis via a 25 gram (g) sample split subject ICP-MS. Prospecting and trench rock samples submitted for 30g gold Fire-Assay analysis and multi-element geochemistry by four-acid ICP-ES. Thunderstruck has relied on the external QA/QC of ALS which included the insertion of insertion of standard, blank and duplicate samples at a rate of 10% into the sample stream to confirm the accuracy of the reported results. **Surface trenches were dug by hand to a maximum depth of 1m into saprolite with the goal of reaching weathered in-situ bedrock approximating the B/C soil profile transition. In all cases where the B/C transition was reached pervasively clay altered saprolite rock present often showing relict primary textures, alteration and mineralization in the form of weathered sulphide minerals. Given the hand-excavated nature of the trenches and heavy forest cover at Liwa Creek continuous ground sampling was often not possible due to the presence of tree root masses. As such trench results are presented with sample width and assay data including all un-sampled intervals. This news release contains certain statements that may be deemed "forward-looking statements". Although Thunderstruck believes the expectations expressed in such forward-looking statements are based on reasonable assumptions, such statements are not guarantees of future performance and actual results may differ materially from those in forward looking statements. Forward looking statements are based on the beliefs, estimates and opinions of Thunderstruck's management on the date the statements are made. Except as required by law, Thunderstruck undertakes no obligation to update these forward-looking statements in the event that management's beliefs, estimates or opinions, or other factors, should change.